Background in my 4/12/18 posting “chicken fried chicken”. The dish called chicken fried steak is not merely steak cooked like (Southern) fried chicken — coated and then fried (usually deep-fried, but sometimes pan-fried) — but is steak (a) boned, (b) pounded flat to tenderize it, and (c) pan-fried, then (d) served with a cream gravy. If you do this routine with chicken you get chicken fried chicken, sort of a cross between Wiener Schnitzel and Southern fried chicken. 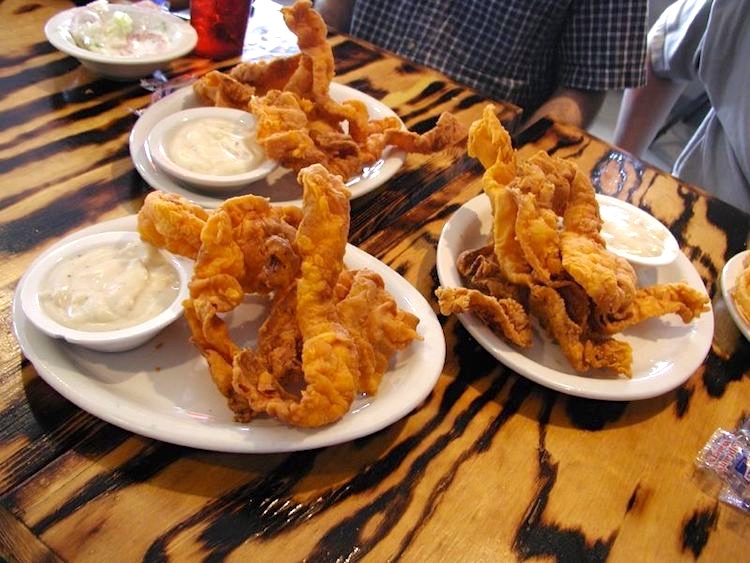 Chicken fried bacon consists of bacon strips dredged in batter and deep fried, like chicken fried steak. It is an American dish that was introduced in Texas in the early 1990s. Frank Sodolak of Sodolak’s Original Country Inn in Snook, Texas, states that he invented the dish; however, a similar recipe in the Louisiana Cookery cookbook by Mary Land uses salt pork, the bacon of its day. It is usually served as an appetizer with cream gravy or sausage gravy for dipping and sauce. Sodolak’s version serves six strips of bacon, battered and fried, with a bowl of cream gravy. He and his restaurant were featured on a Texas Country Reporter episode; the web video has been watched hundreds of thousands of times on YouTube. It seems not to have any appreciable amount of sugar in it, but otherwise it’s fats, carbs, and salt. No doubt it’s mortally tasty. This entry was posted on June 20, 2018 at 2:13 pm and is filed under Language and food, Names. You can follow any responses to this entry through the RSS 2.0 feed. You can leave a response, or trackback from your own site. Make it gluten free and I’ll try it in the name of science.